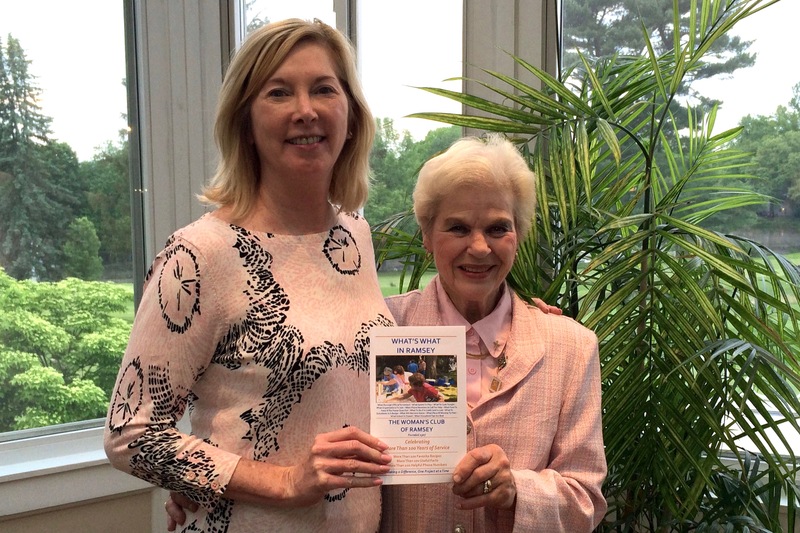 Anne O’Loughlin, right, receives her Ramsey Volunteer of the Year award from Marjorie Detweiler. Anne was also presented with a framed certificate from the Woman’s Club. 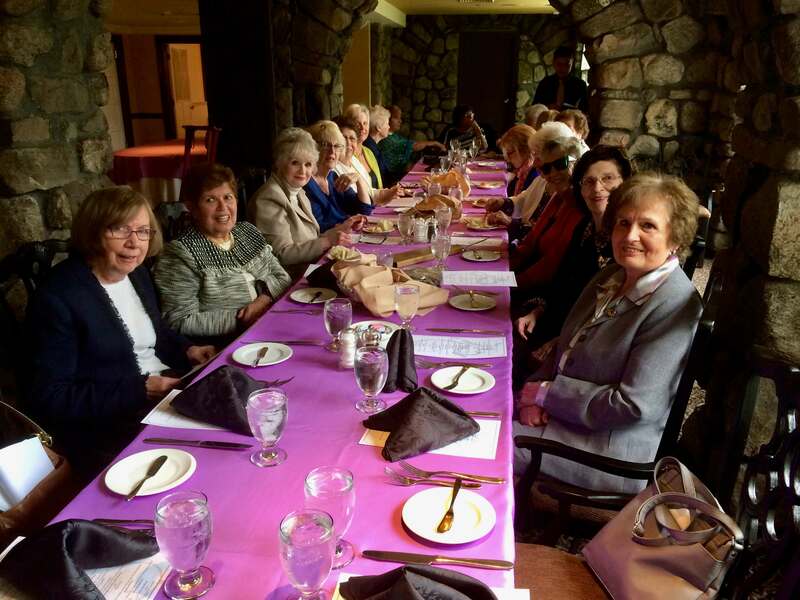 Tina Pellicciari, Pat Bernius and Marjorie Detweiler were among Club members who enjoyed an Oktoberfest luncheon. 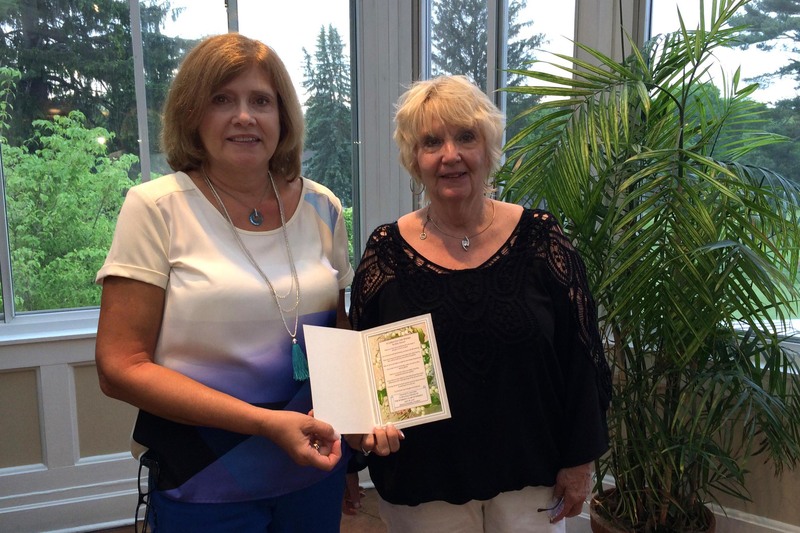 Anne O’Loughlin, who was named to the NJSFC Honor Roll, received her certificate and charm from Club President Marjorie Detweiler. 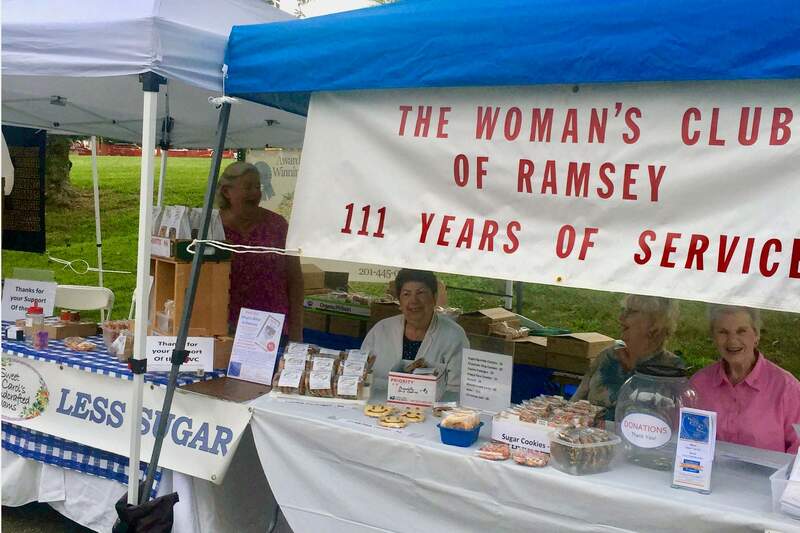 Sweet Carol’s Jams were a big draw at Ramsey Day. 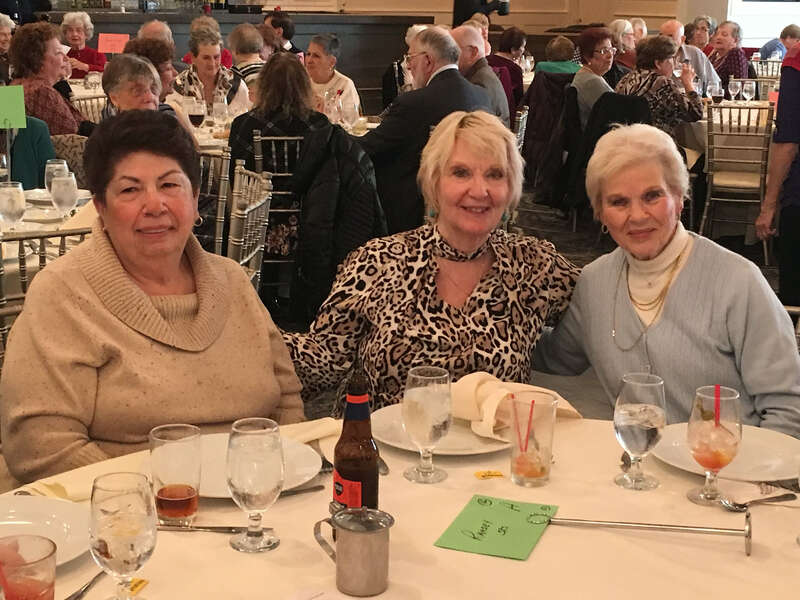 Tina Pellicciari, Pat Bernius and Marjorie Detweiler were among the volunteers who helped make the fundraiser a success. 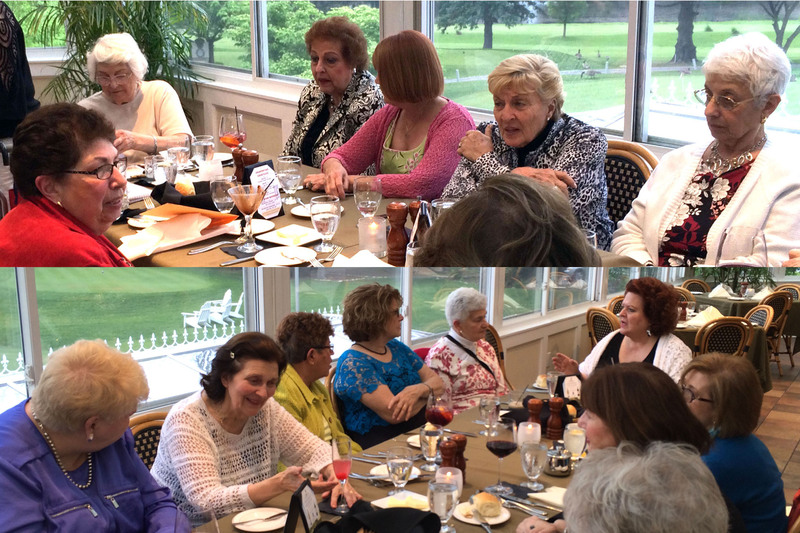 Among those enjoying the RGCC end-of season luncheon were Helen Mekita, Katie Parker, Paula Bartow, JoAnne Bockhorn, Bev Walsh, Dorothy Verdone, Janet Klein, Toni Small, Anne O’Loughlin, Elaine Muzzillo, Marjorie Detweiler, Tina Pellicciari, Pat Bernius, Marilyn Saias, Kathy Ambrose and Dolores de Vinck. 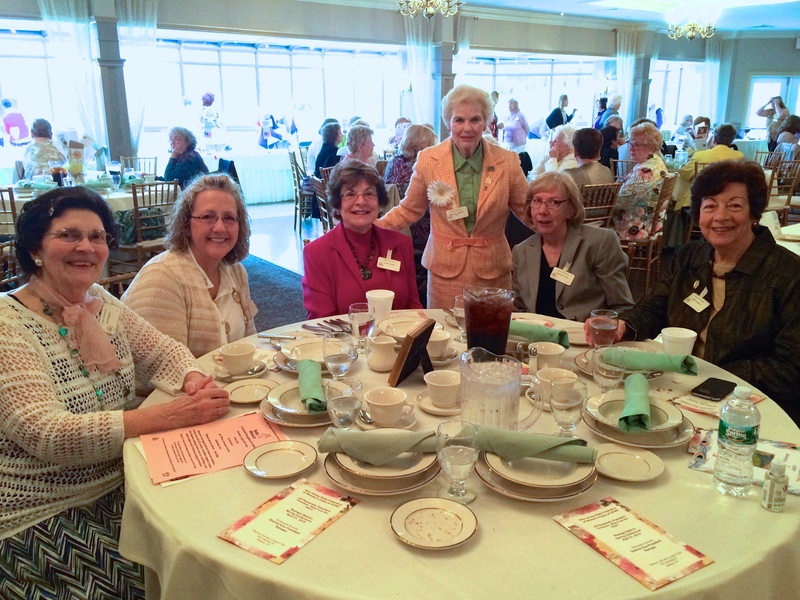 Marilyn Saias, Julliet Borgersen, Marjorie Detweiler, Helen Mekita, and Dolores De Vinck, seated, and Paula Bartow, Dorothy Verdone, Anne O’Loughlin, Elaine Muzzillo and Janet Klein attended the April Achievement Day luncheon. Members swept four gold awards. 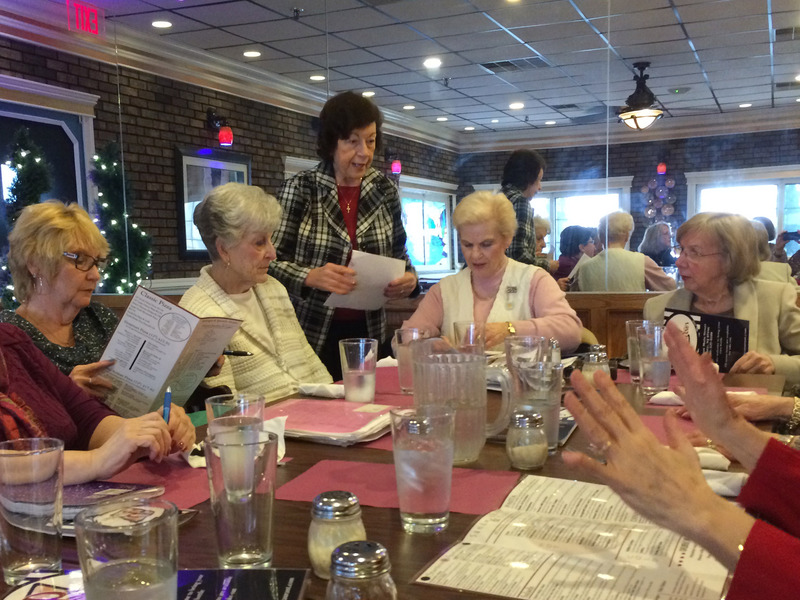 At their February luncheon, Woman’s Club members planned events for the spring and summer. 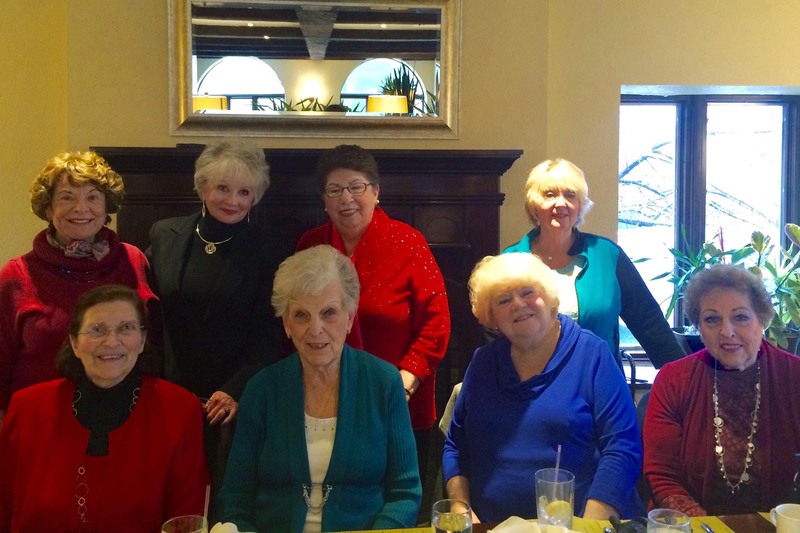 The group included, from left, Marilyn Saias, Dorothy Verdone, Janet Klein, Kathy Ambrose, Marjorie Detweiler, Tina Pellicciari, Pat Bernius, Margaret Wellman, Paula Bartow, Julliet Borgersen, Katie Parker, Helen Hodge and, standing, Helen Mekita. 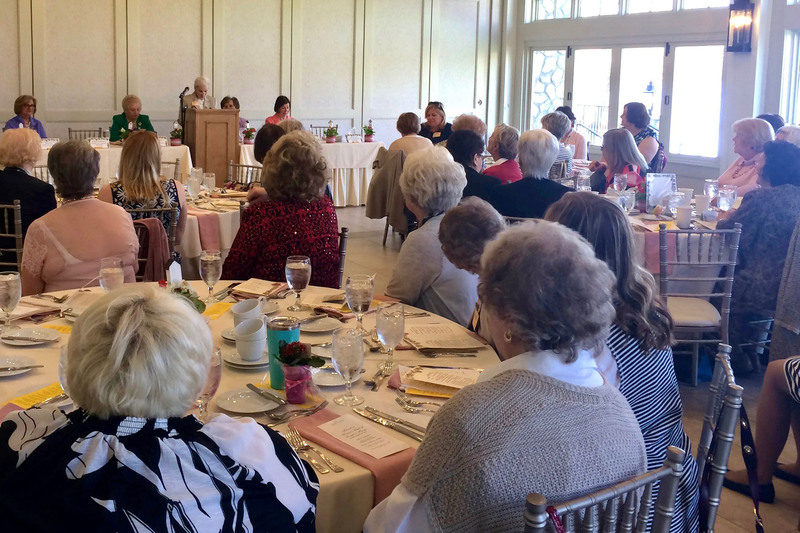 Woman’s Club members kicked off their 2018 schedule with a January luncheon at the Ramsey Golf & Country Club. Enjoying the gathering are, from left, Dolores de Vinck, Marjorie Detweiler, Dorothy Verdone, Katie Parker, Helen Mekita, Kathy Ambrose, Pat Bernius, Tina Pellicciari, JoAnne Bockhorn and Julliet Borgersen. 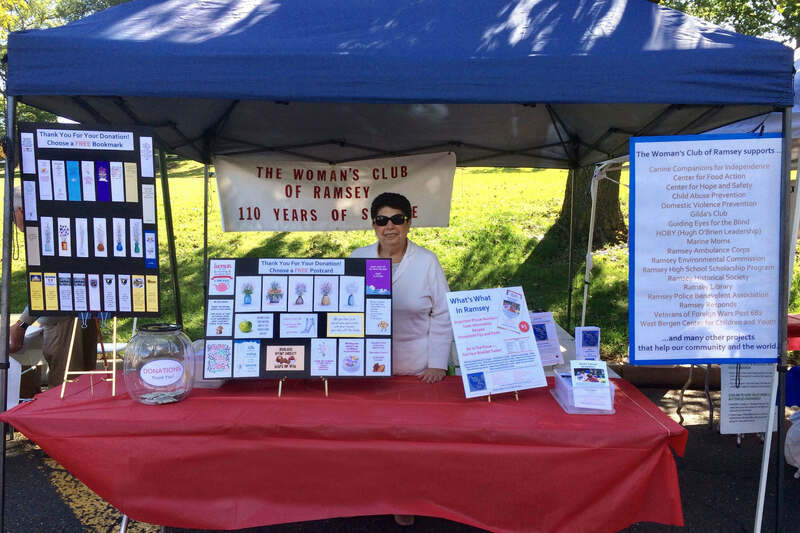 After helping set up the Ramsey Day booth in September, Tina Pellicciari was ready for the crowd. Club members sold What’s What In Ramsey booklets and handed out bookmarks and postcards as a thank-you for donations. 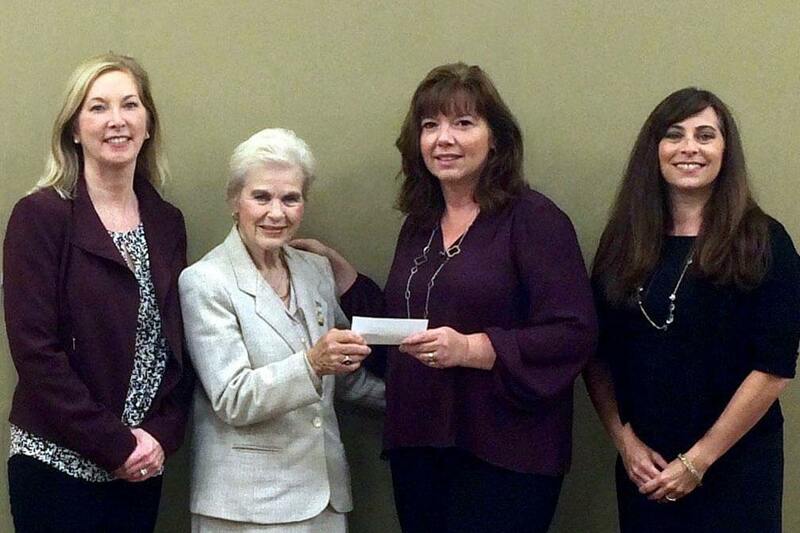 In September, Marjorie Detweiler gave a check to Library Board President Anissa Martin and Board members Mayor Deirdre Dillon and Councilman Vanessa Jachzel. 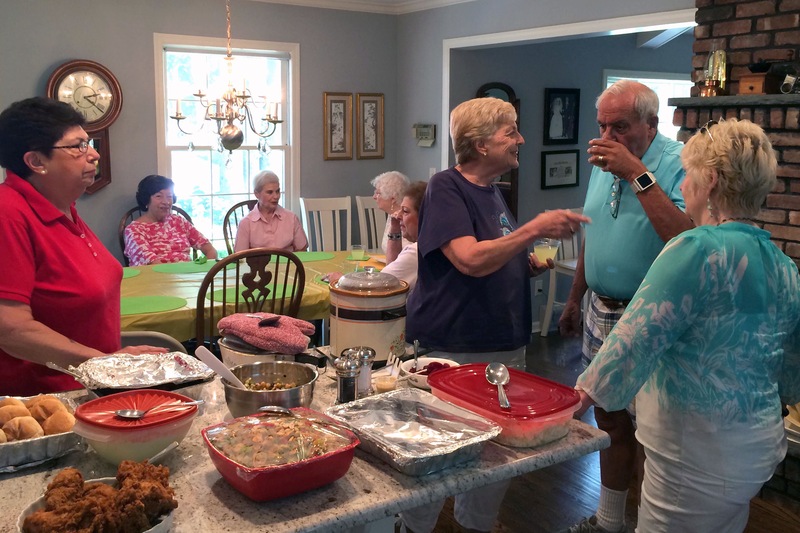 Among the 20 members and guests at the Summer Luncheon were, from left, Paula Bartow, Bob and Julliet Borgersen, Tina Pellicciari, Margaret Wellman, Helen and Frank Mekita, and Charles Bartow. 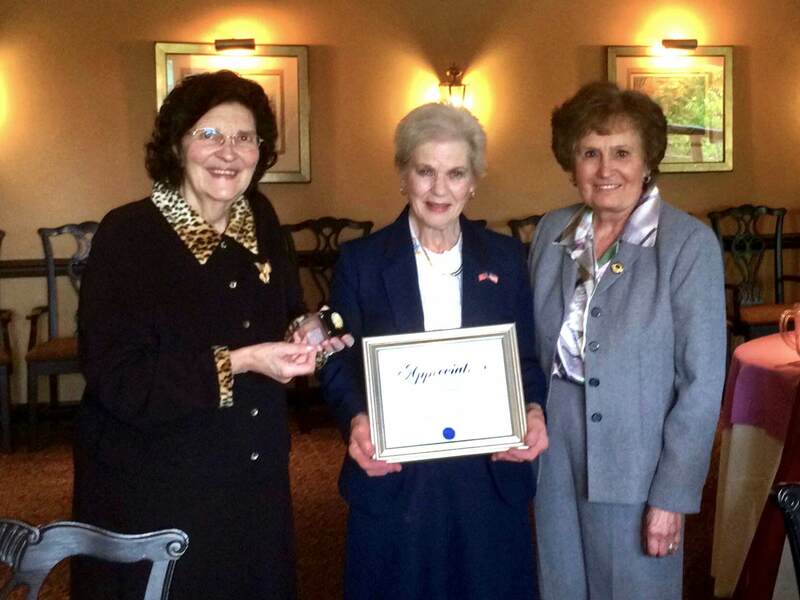 At the May Installation Dinner, Marjorie Detweiler, Club president for the past five years, was honored by Paula Bartow and District Vice President Virginia Huresky. 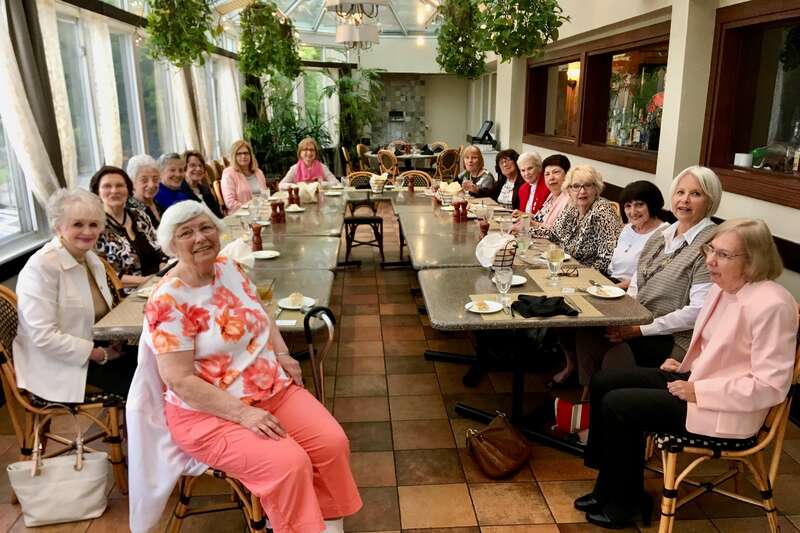 Among the dinner guests were Lori de Vinck, Julliet Borgersen, Katie Parker, Pat Bernius, Tina Pellicciari, Kathy Ambrose, Marge Detweiler, Ann O’Loughlin, Elaine Muzzillo, Margaret Wellman, Ann Nardo, Toni Small, JoAnne Bockhorn, Bev Walsh, Paula Bartow and District Vice President Virginia Huresky. 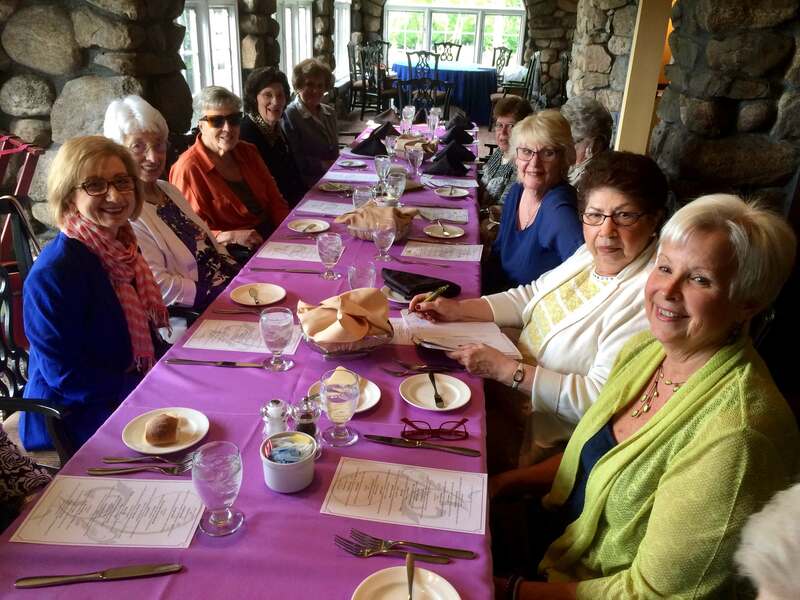 Toni Small, JoAnne Bockhorn, Bev Walsh, Paula Bartow, Virginia Huresky, Julliet Borgerson, Pat Bernius, Katie Parker, Tina Pellicciari and Kathy Ambrose enjoyed the May Installation Dinner. 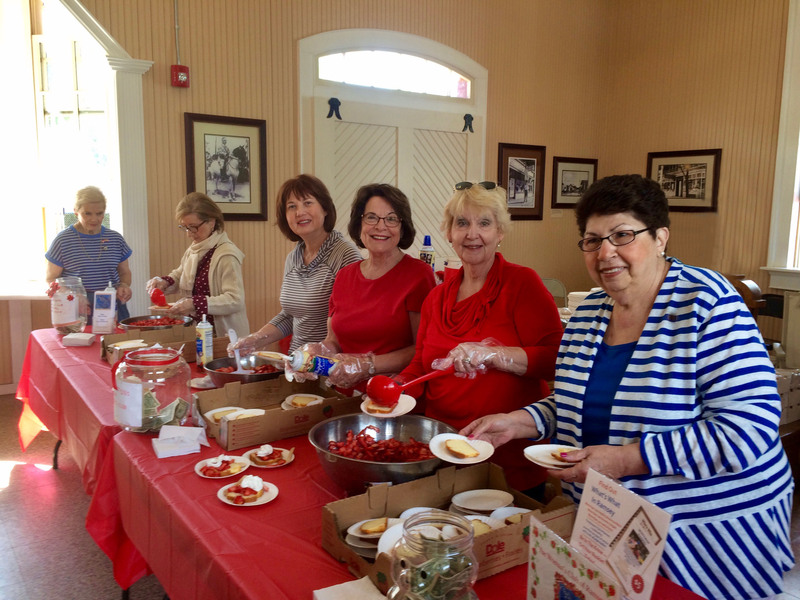 Marge Detweiler, Toni Small, Verda Kesedar, Dorothy Verdone, Pat Bernius, and Tina Pellicciari served free strawberry shortcake in the Ramsey train depot at the Club’s June Strawberry Festival at the Farmer’s Market. 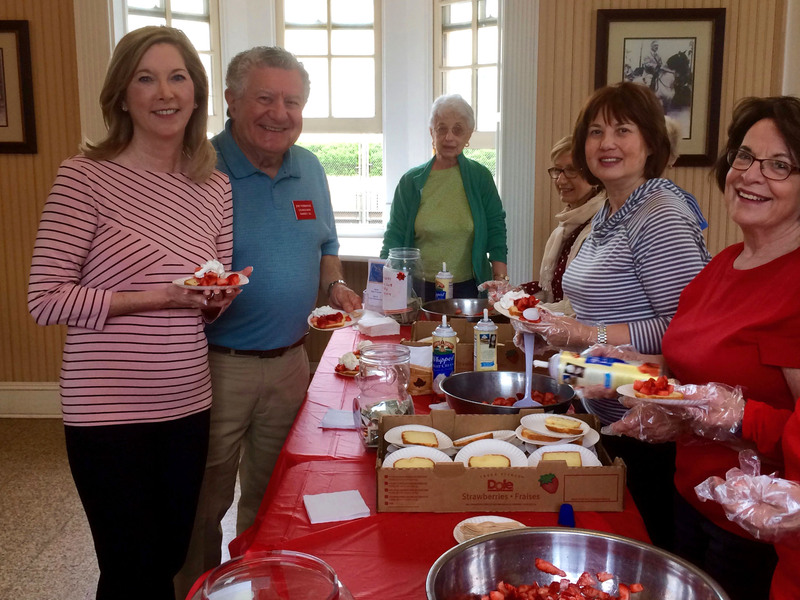 Mayor Deirdre Dillon and Councilman Joe Verdone enjoy strawberry shortcake offered by JoAnne Bockhorn, Toni Small, Verda Kesedar and Dorothy Verdone. 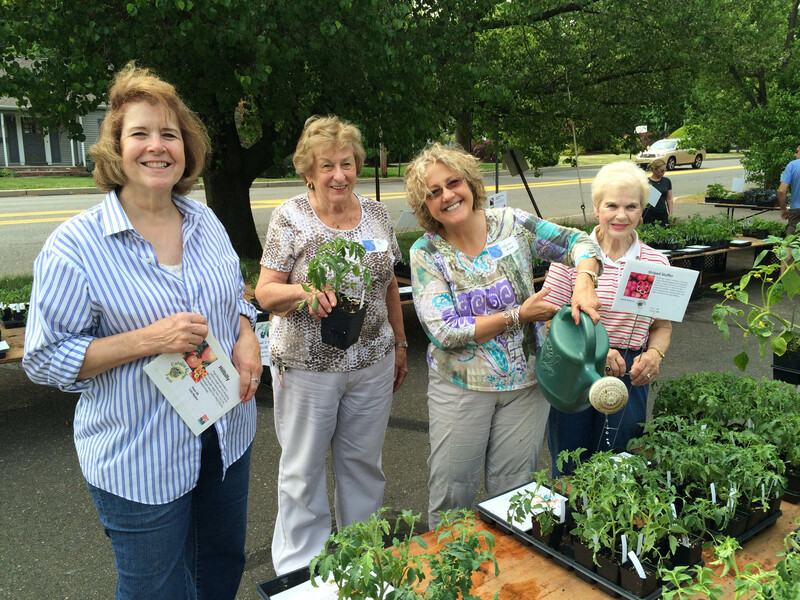 Toni Small, Pat Bernius, Marge Detweiler, Tanis LaManna and Janet Klein were among the helpers at the May plant sale. 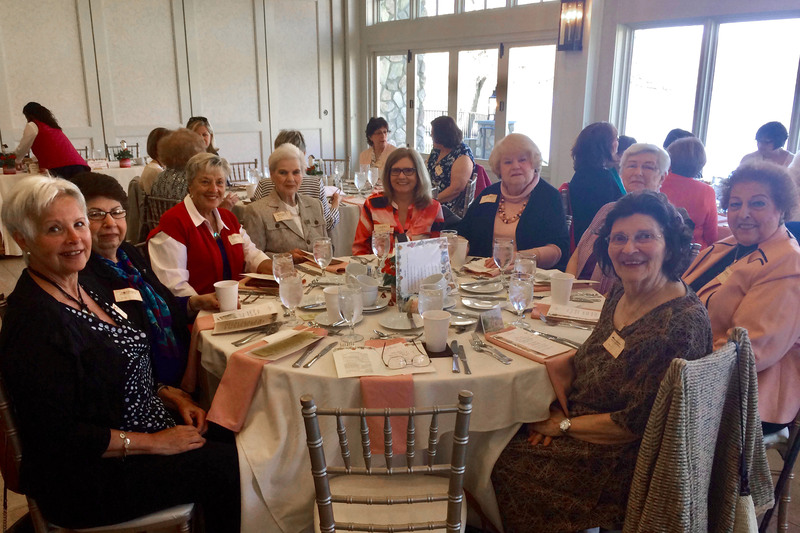 Enjoying the 2017 Achievement Day luncheon are, from left around the table, Kathy Ambrose, Tina Pellicciari, Bev Walsh, Marge Detweiler, Janet Klein, Betty Green, Helen Mekita, Ann Nardo and Paula Bartow. Two members won prizes for their entries. 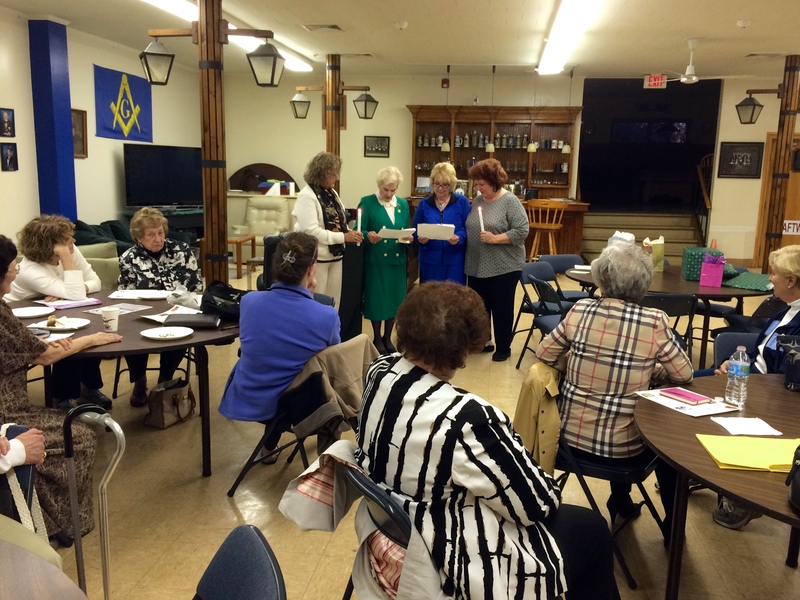 At the Spring District Conference, President Marjorie Detweiler reported on the Club’s activities. 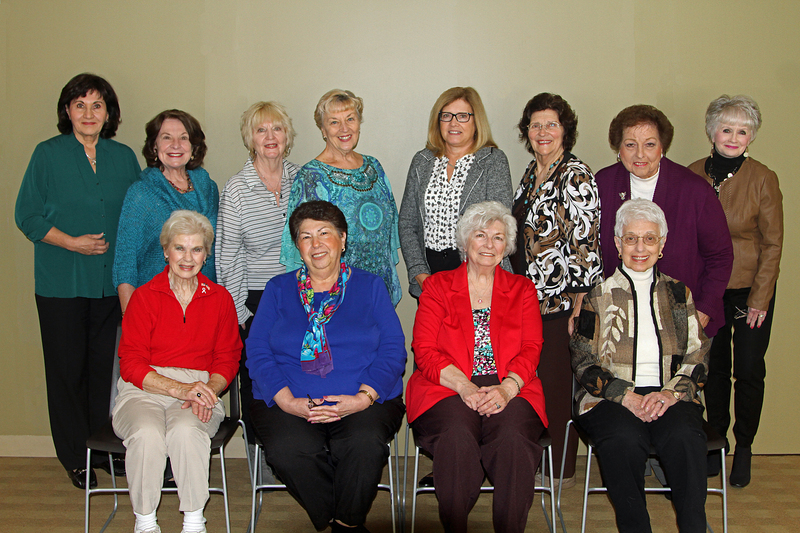 The December 2016 issue of Downtown Ramsey ran a story about the Club, “Ladies Who Love Ramsey.” Featured in the accompanying photo were, from left, standing, Linda Korsen, Dorothy Verdone, Pat Bernius, Bev Walsh, Janet Klein, Paula Bartow, Ann Nardo and Katie Parker; seated, Marge Detweiler, Tina Pellicciari, Helen Mekita and JoAnne Bockhorn. 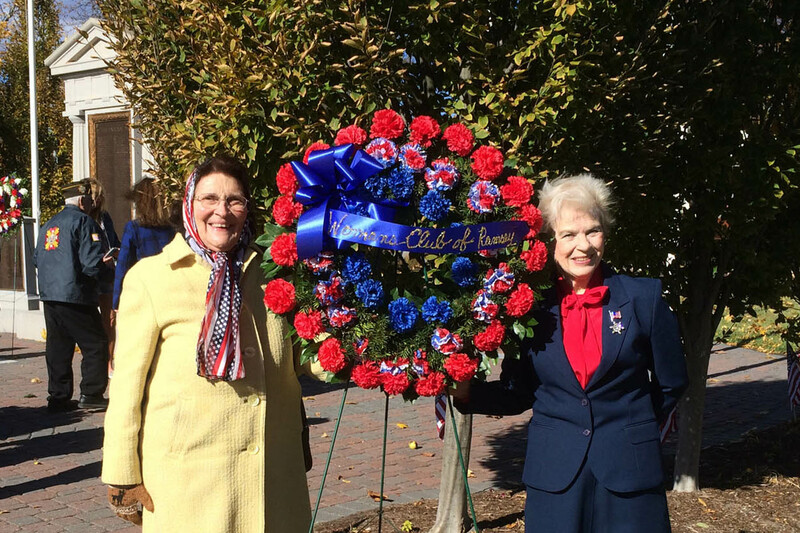 Paula Bartow and Marge Detweiler present a wreath on Veterans Day. 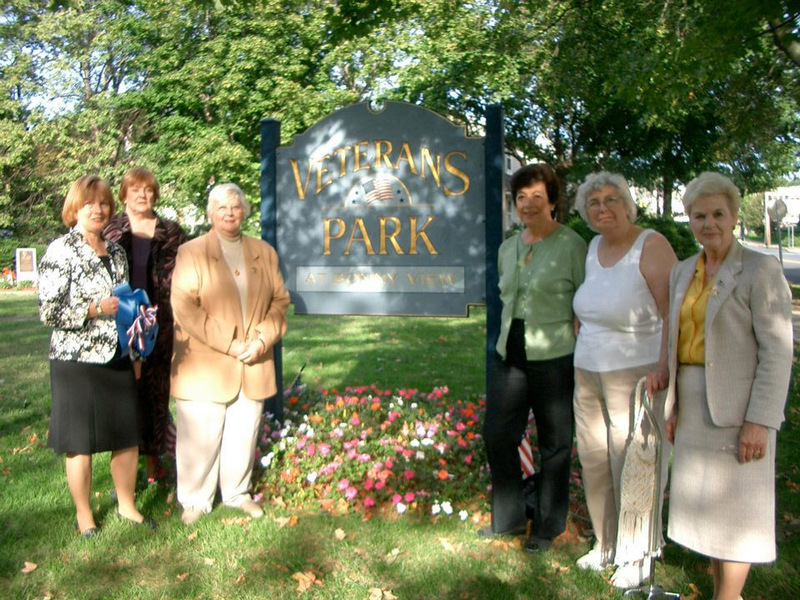 The Woman’s Club helped establish Veterans Park. 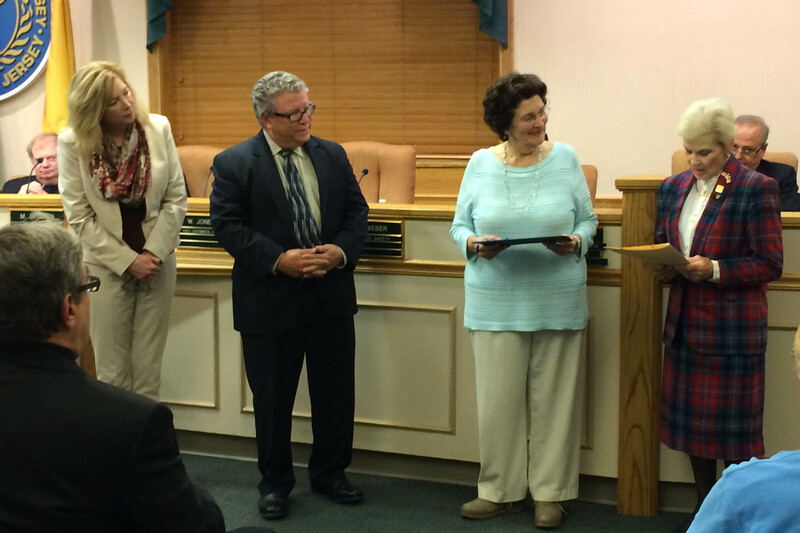 Mayor Deirdre Dillon and Councilman Bill Jones look on as Paula Bartow receives the 2016 Ramsey Volunteer of the Year award from President Marjorie Detweiler. Paula had been Club president and is an active liaison with District and State Woman’s Club boards. 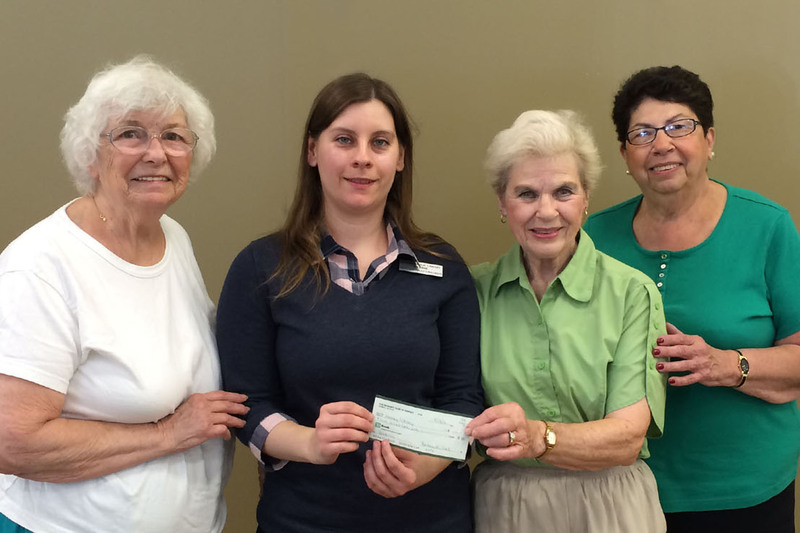 Debbie Burnette, Teen and Adult Librarian, accepts a contribution to the Ramsey Library from Helen Mekita, Marjorie Detweiler and Tina Pellicciari. 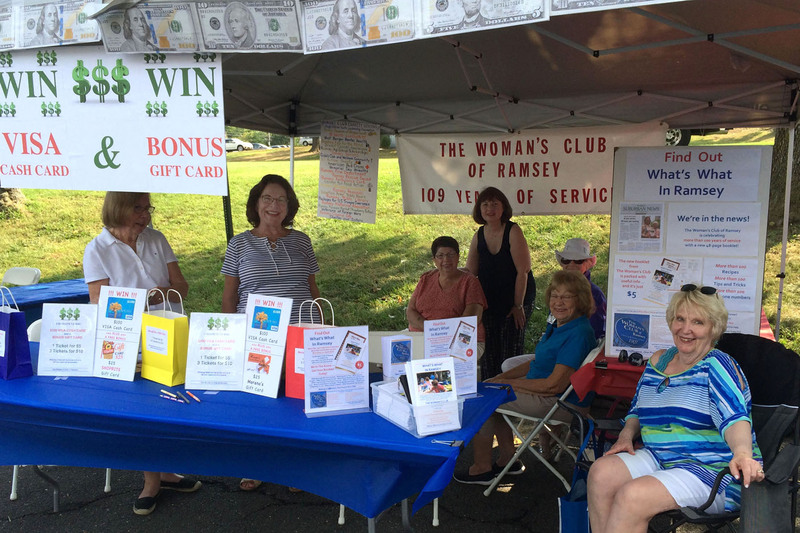 Lori de Vinck, Dorothy Verdone, Tina Pellicciari, Verda Kesedar, Katie Parker, Ginny Lockhart and Pat Bernius sell raffle tickets at the Club’s Ramsey Day booth. 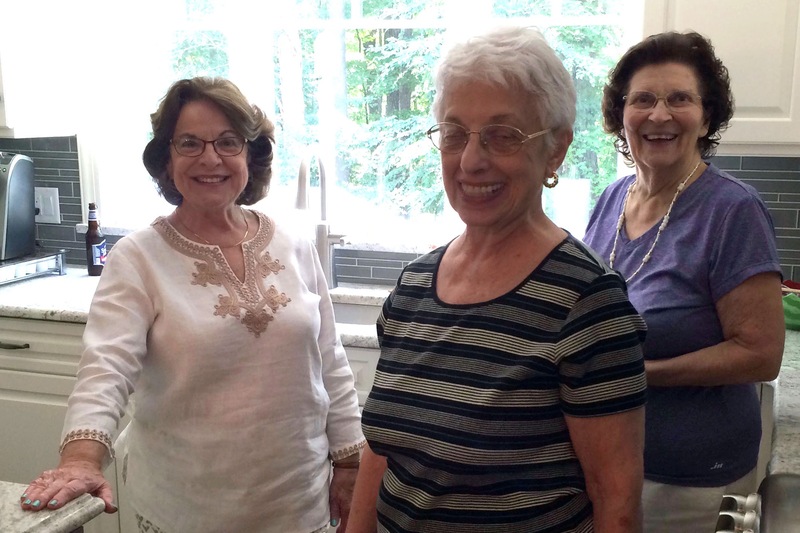 Dorothy, JoAnne Bockhorn and Paula Bartow greet guests at the August picnic hosted by the Verdones. Tina Pellicciari, Bev Walsh, Joel Katz and Pat Bernius socialize at the picnic while Kathy Mucignat, Marge Detweiler, Helen Mekita and Ann Nardo catch up on news. Kathy, Club President from 2007-2009, and her husband, Al, visited Ramsey from their new home in South Carolina. 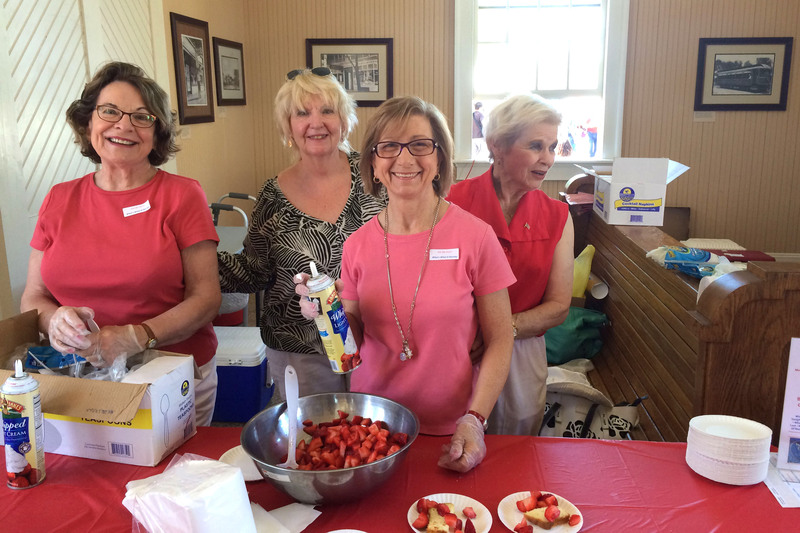 At the Club’s Strawberry Festival, Dorothy Verdone, Pat Bernius, Toni Small and Marge Detweiler serve free strawberry shortcake at the Ramsey train depot. 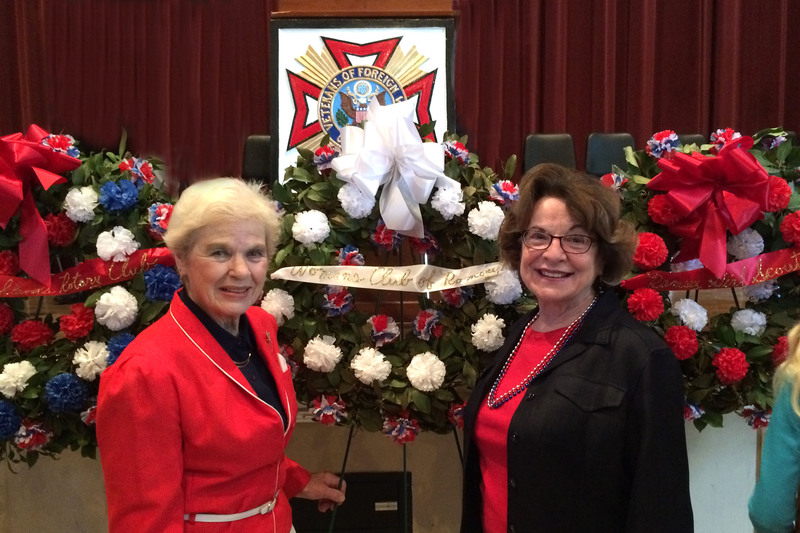 Club President Marjorie Detweiler and Dorothy Verdone present a wreath during Memorial Day ceremonies at the high school. 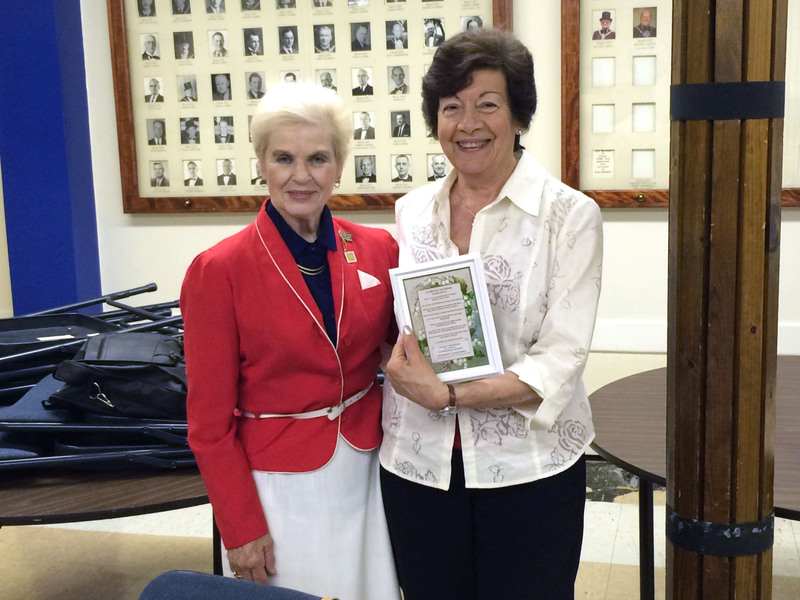 Ramsey Mayor Deirdre Dillon receives a copy of What’s What In Ramsey from Club President Marjorie Detweiler at the May dinner. 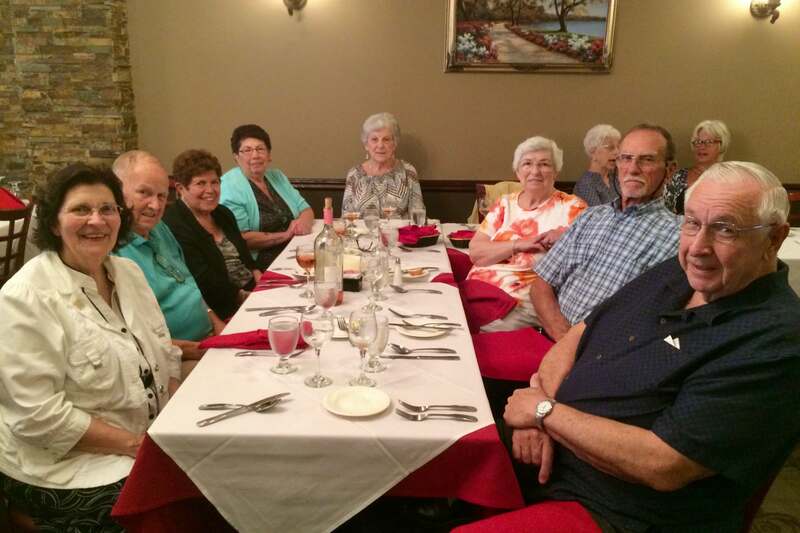 The May dinner at Ramsey Golf & Country Club gave everyone a chance to catch up on memories, install a new member and start planning for fall projects. New member Janet Klein accepts a copy of the Collect for Club Women from Pat Bernius. 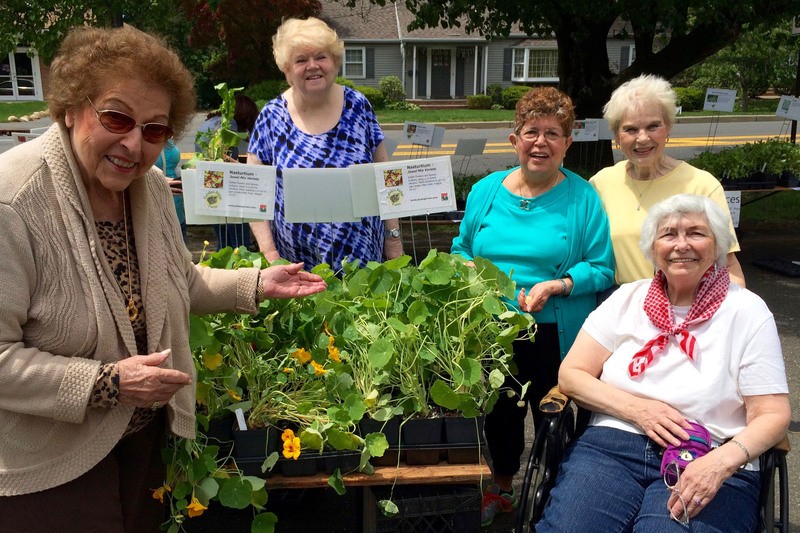 Ann Nardo, Betty Green, Julliet Borgersen, Marge Detweiler and Helen Mekita show off the nasturtiums at the May plant sale. 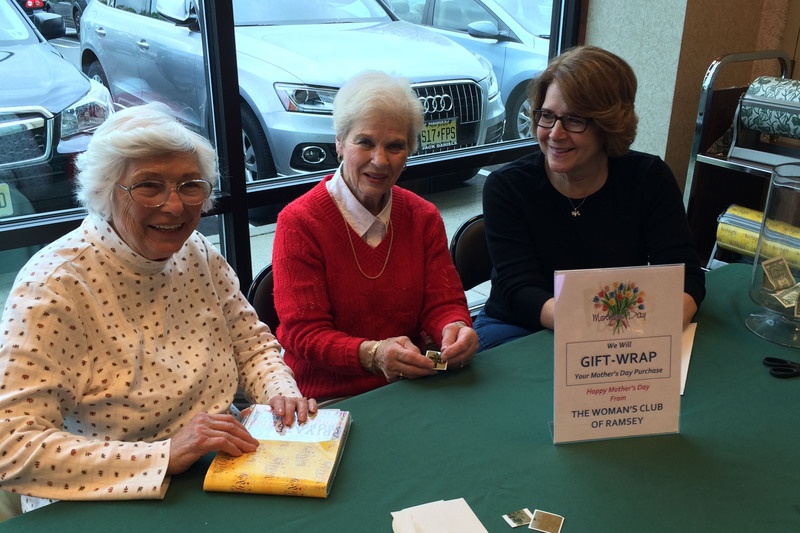 Helen Mekita, Marge Detweiler and Tanis LaManna raised funds by wrapping Mother’s Day gifts at Barnes & Noble. 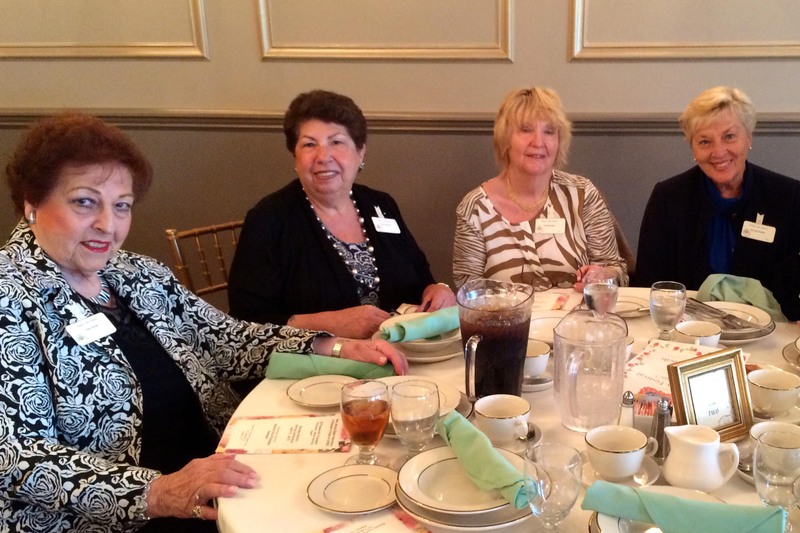 Ann Nardo, Marjorie Detweiler, Paula Bartow, Dorothy Verdone and Anne O’Loughlin enjoyed the 2016 Achievement Day Luncheon. 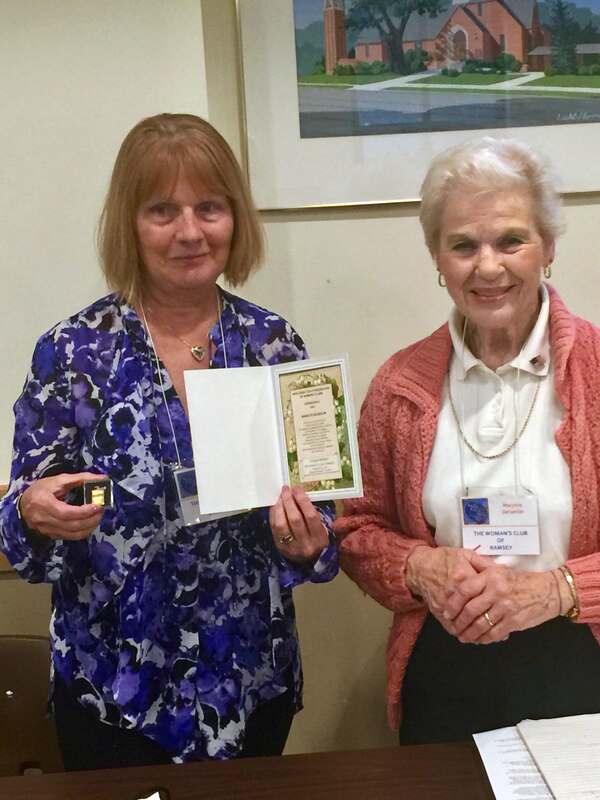 After giving a talk about Andy, the Ramsey Peacock, and teaching her audience how to balance peacock feathers, Marjorie Detweiler, right, accepted the Ramapo District Performing Arts Day First Place award from Chairman Rosemary Havron. 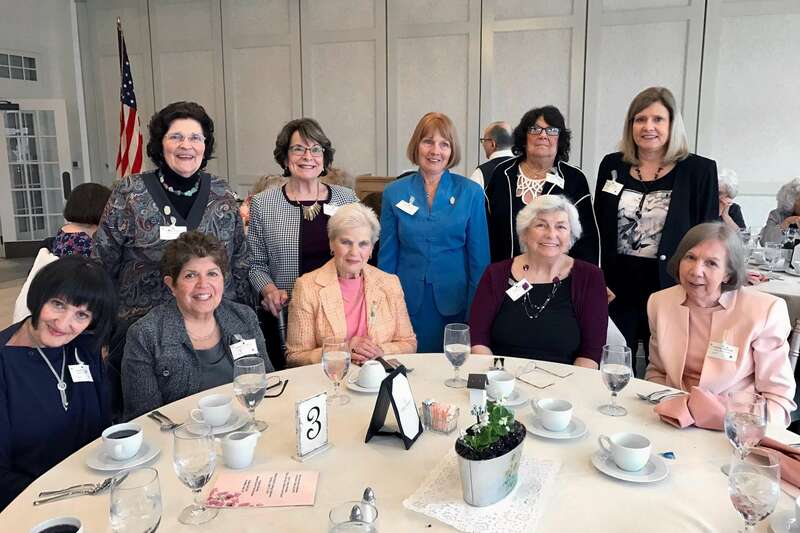 Among the members at the February lunch meeting at Ramsey Golf & Country Club were, standing, Dorothy Verdone, Katie Parker, Tina Pellicciari and Pat Bernius; seated, Paula Bartow, Margaret Wellman, Betty Green and Ann Nardo. 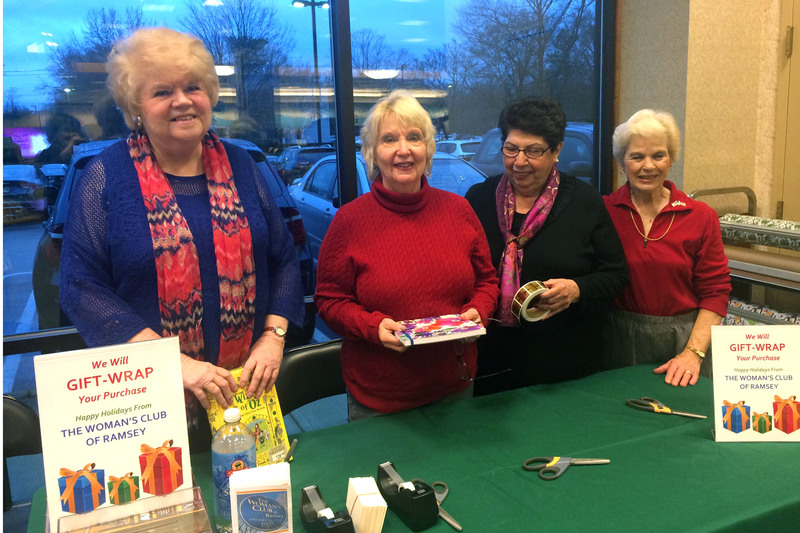 To kick off the holiday season, Betty Green, Pat Bernius, Tina Pellicciari and Marge Detweiler were in the first group of many Woman’s Club volunteers who raised funds by offering free gift wrapping at Barnes & Noble. 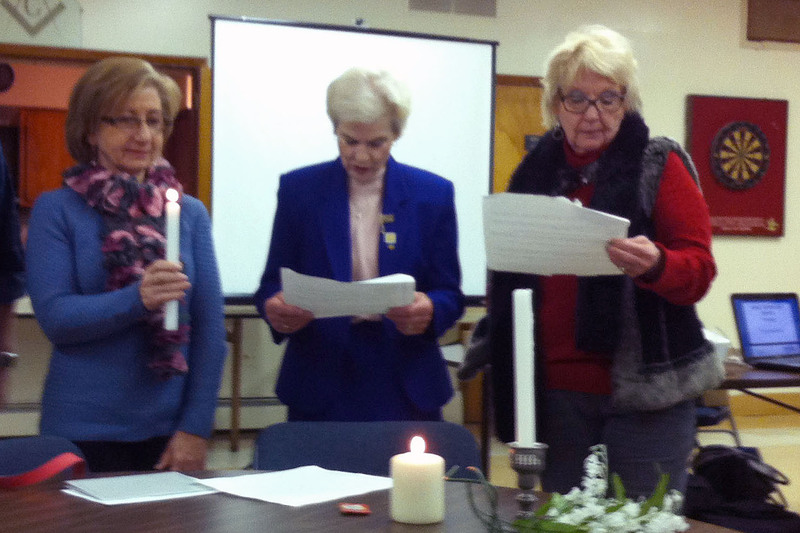 Toni Small is installed as a member of the Woman’s Club by President Marjorie Detweiler and Membership Chairman Pat Bernius. 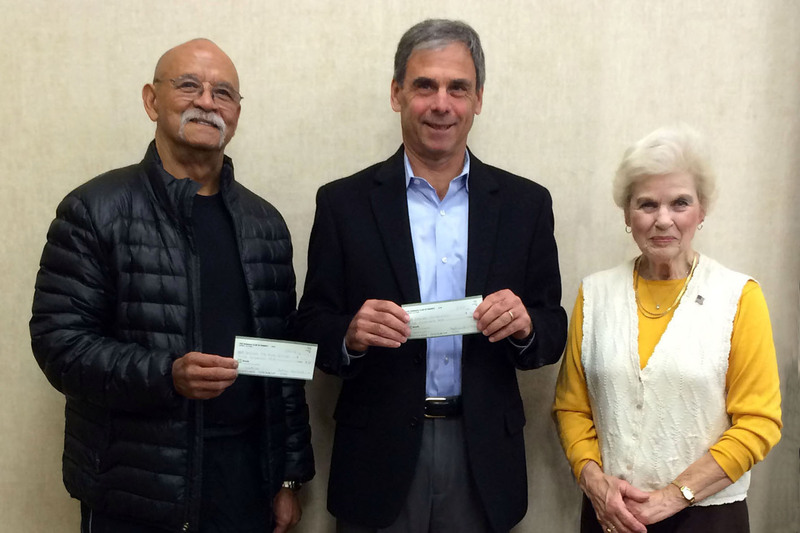 In November, Jim James and Harris Recht accepted $500 checks from Marjorie Detweiler to help support the Center for Food Action and Ramsey Responds. 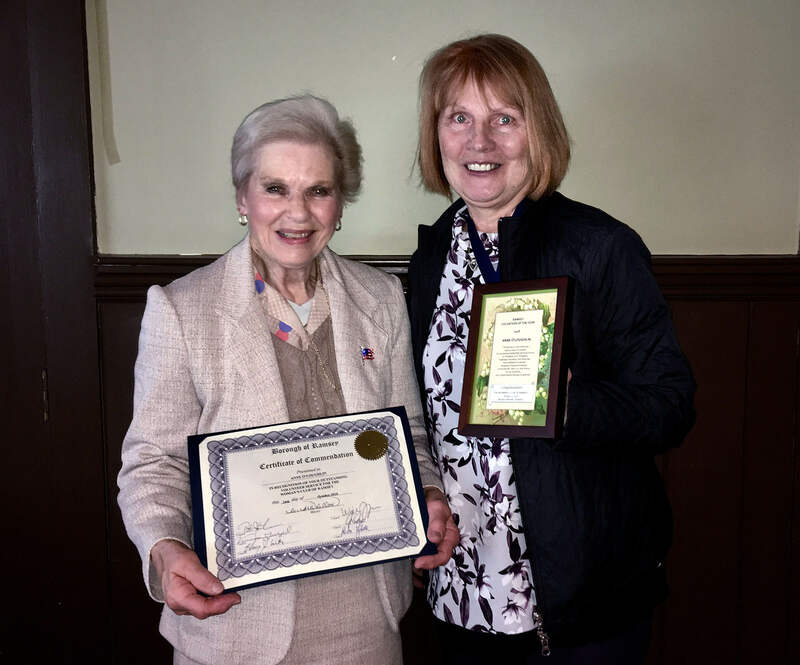 Mayor Diedre Dillon presented Ramsey Volunteer of the Year awards to Linda Korsen and Tina Pellicciari as Club President Marge Detweiler outlined their accomplishments. Kathy Mucignat, who has moved to South Carolina, also received an award. 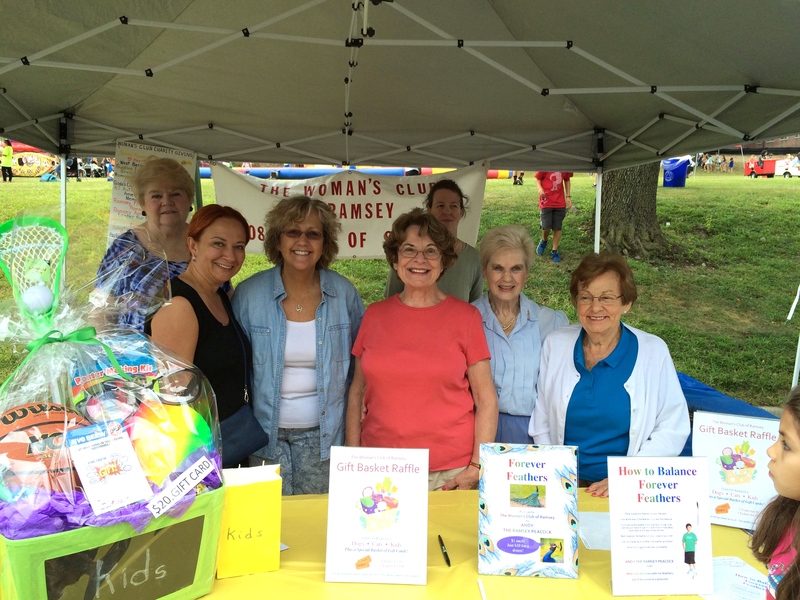 Dorothy Verdone, center, organized the Ramsey Day booth. Betty Green, Jade Gunver, Helen Hodge, Marge Detweiler and Ginny Verdone helped sell raffle tickets for attractive gift baskets. 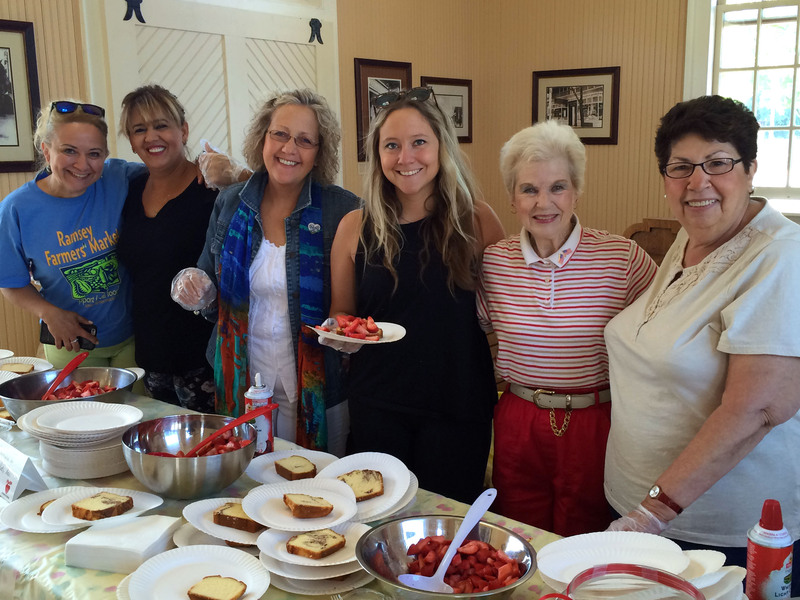 Jade Gunver, left, pulled together the Strawberry Festival held at the Farmer’s Market in June. 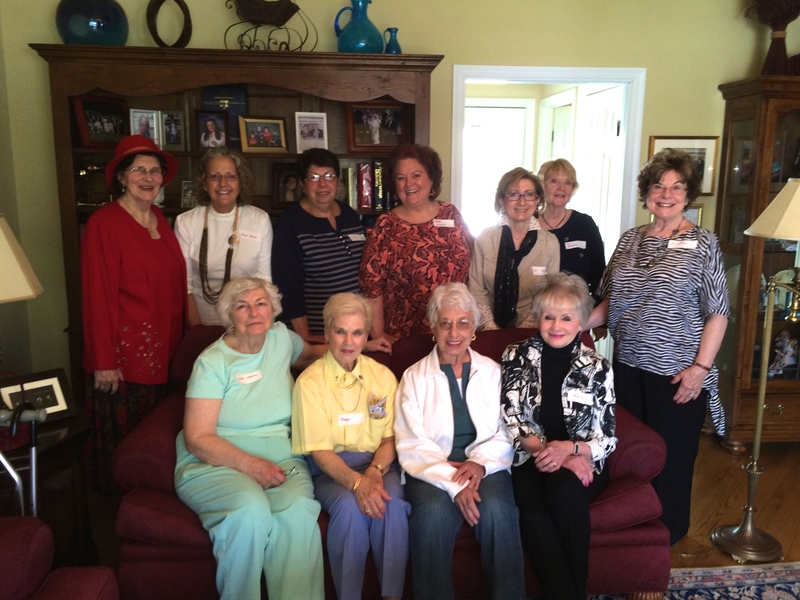 Her hostesses included Mary Ertugrul, Helen Hodge, Ayşe Keler, Marge Detweiler and Tina Pellicciari. 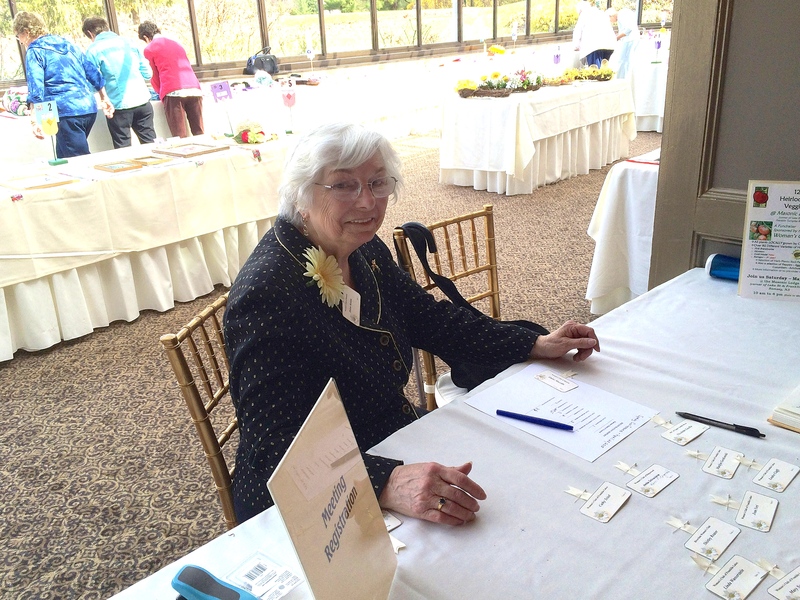 Tanis LaManna masterminded the May 2015 plant sale. 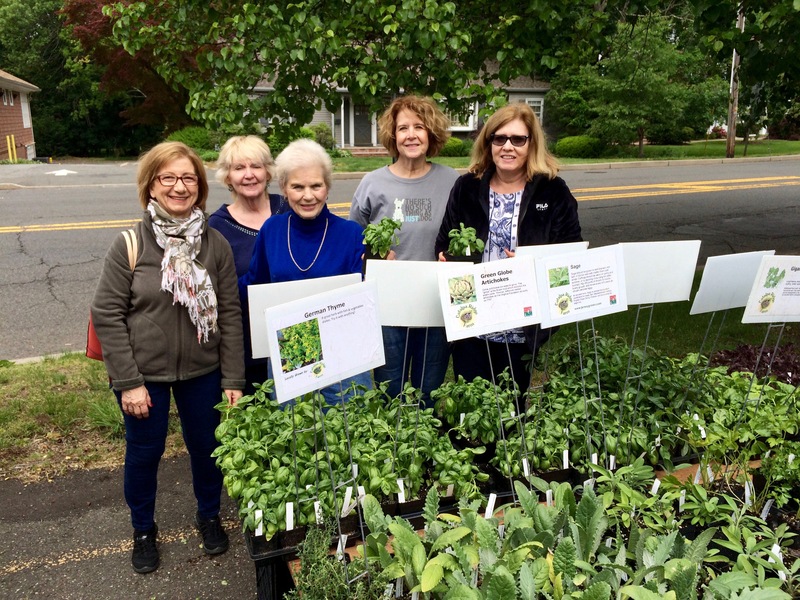 Jo Rosencrantz, Helen Hodge and Marge Detweiler kept the plants fresh for Ramsey gardeners. 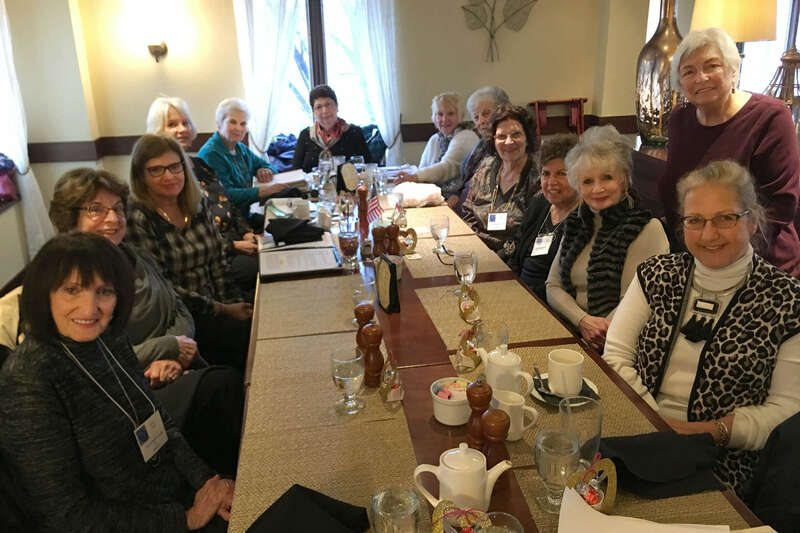 Paula Bartow, Helen Hodge, Tina Pellicciari, Valerie Shurko, Toni Small, Pat Bernius, Dorothy Verdone, Helen Mekita, Marge Detweiler, JoAnne Bockhorn and Katie Parker socialized at a brunch for prospective members at Dorothy’s home. Helen Hodge and Valerie Shurko were welcomed by President Marge Detweiler and Membership Chairman Pat Bernius at an Installation Dinner. 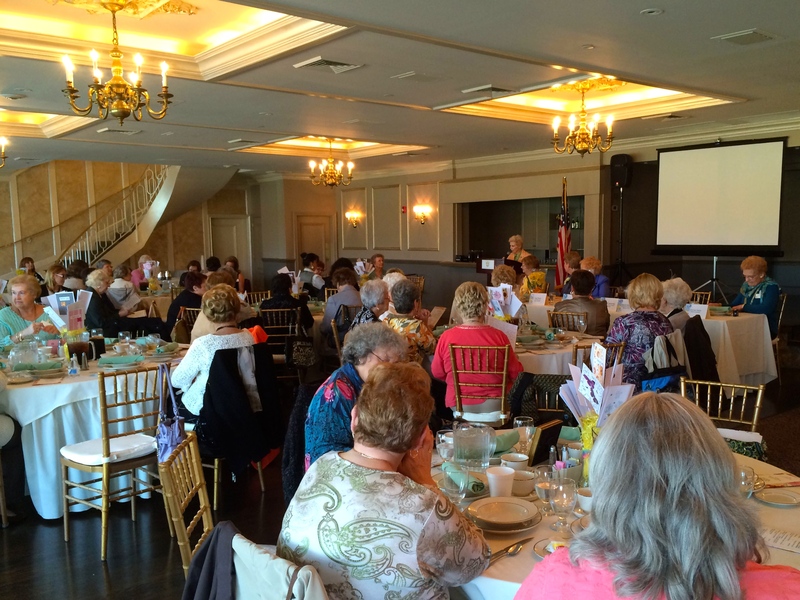 At the Ramapo District Spring Conference Achievement Day, President Marge Detweiler reported on the accomplishments of the Club. 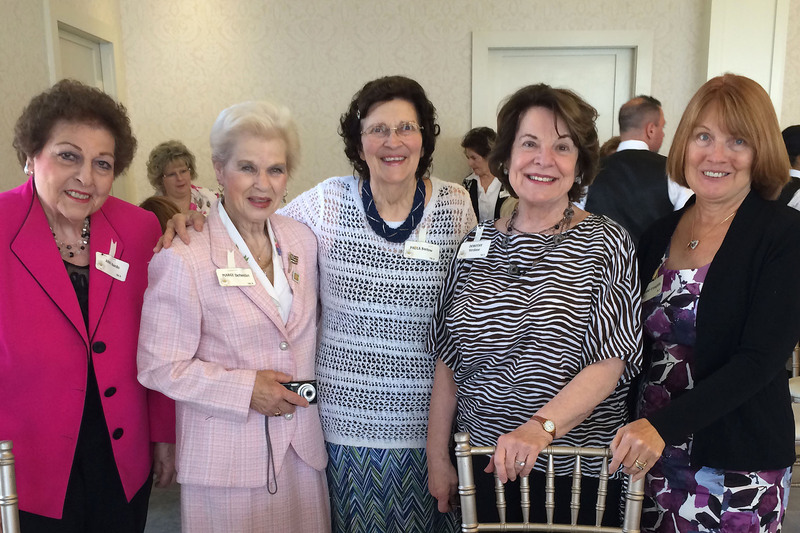 Achievement Day guests included Helen Hodge, Dorothy Verdone, Marge Detweiler, Lori de Vinck and Kathy Mucignat. 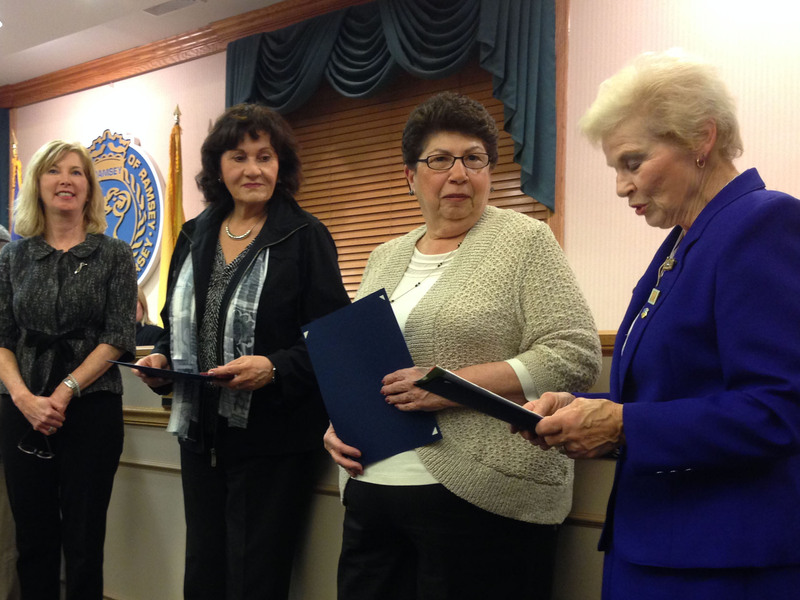 Ann Nardo, Tina Pellicciari, Pat Bernius and Bev Walsh learned that three members won Achievement Day honors. Helen Mekita handled registration at Achievement Day. 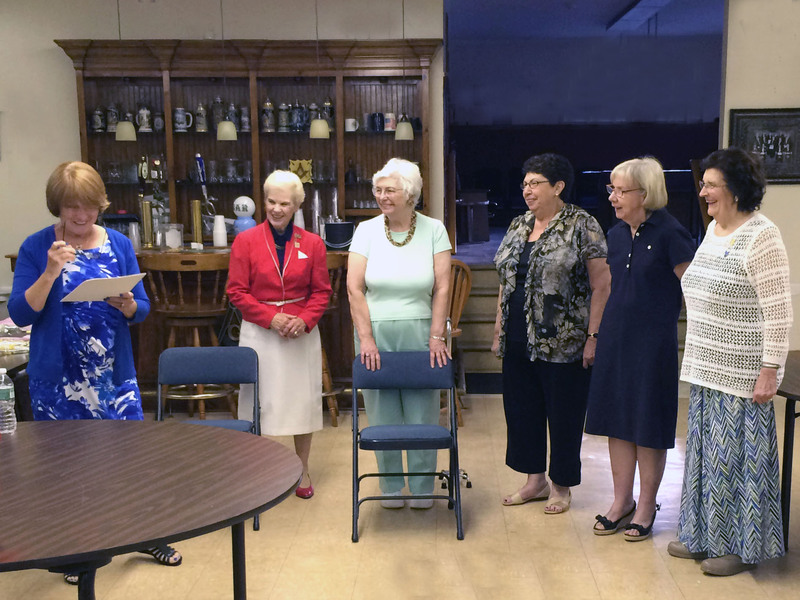 Anne O’Loughlin installed President Marjorie Detweiler, Vice President Helen Mekita, Secretary Tina Pellicciari, Treasurer Dolores de Vinck and Federation Secretary Paula Bartow. 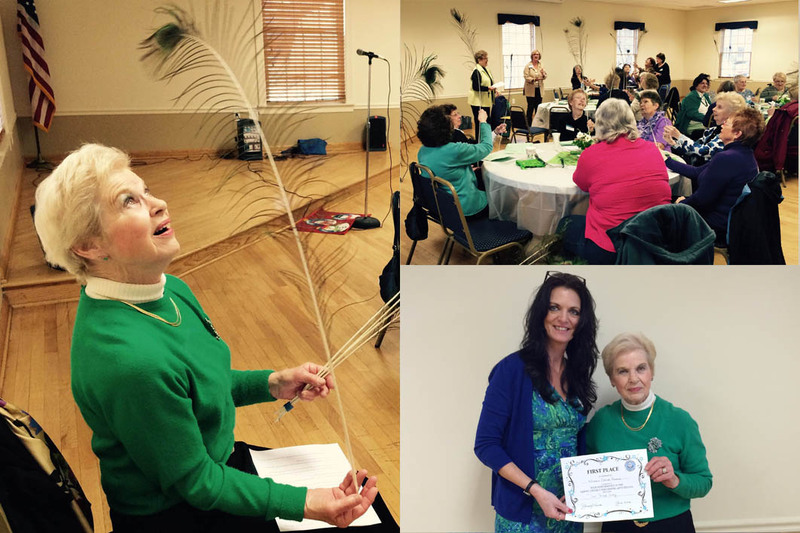 Marge Detweiler presented an award for 15 years of outstanding service to Past President Kathy Mucignat, who is moving to South Carolina. 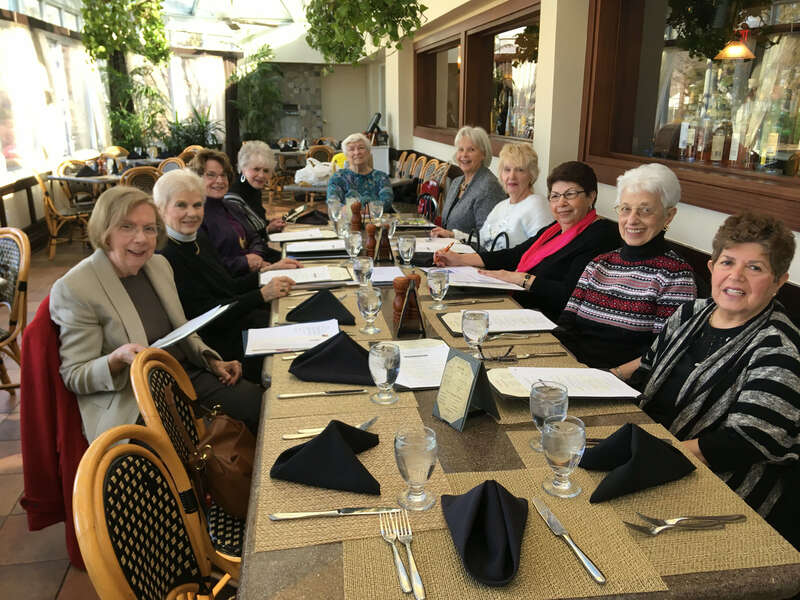 Elaine Muzzillo, Margaret Wellman, Kathy Mucignat, Marge Detweiler, and Lori de Vinck combined business with pleasure at a luncheon meeting. 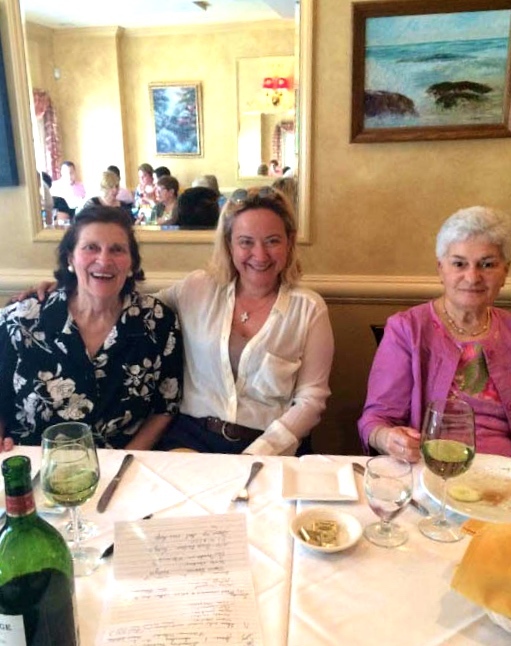 Paula Bartow, Jade Gunver and Lucille Delano enjoyed a spring luncheon. The Ramsey Woman’s Club was instrumental in establishing Veteran’s Park.